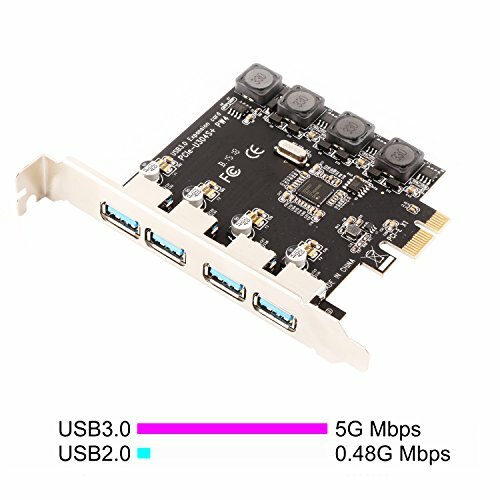 Ubit U3044 expansion card allows device add four USB 3.0 super fast 5Gbps ports on desktop computers for video ,audio ,photos or files transfer. Build in Self-Powered Technology for high power-consuming data devices such as hard disk. What is Ubit Self-Powered technology? Self-Powered Technology is a solution to add more power supply for USB expansion card. The old version PCI Express USB card need to plug a power cable from the desktop computer power control center. Even you add additional power sometime it lack of power when you running few high power-consuming devices simultaneously like hard disk.PCI Express Slot can provide 75W max almost 12V/6.25A. We add on a voltage transformer on the USB card get 5V/15A max power. Then we add a power module on each USB ports distribute current for each port 5V/2A.Most of the high power-consuming devices just need 4~8W which means this USB expansion card can be running few the high power-consuming device simultaneously in high speed. To protect data device we build a safety electric circuit protector for each ports. Do not worry data loss or burning the data device now .Choose fast and safe data connection with Ubit. Build in Ubit Self-Powered Technology Provide sufficient power(8A max) supply for USB data device. Experience fast data transfer all the time. Running High power-consuming device simultaneously in all USB ports now. Internal USB card from mother board though a PCI Express slot-Ensure stable connection and lost few data transfer speed. Don't have lost connection issue like external USB HUB does. Ubit U3044 expansion card will add on 4 USB 3.0 ports on your desktop computer by PCI Express(1X) slot. Each Super fast USB 3.0 port provide 5Gbps max data transfer speed for video ,audio ,photos or files. Build in Ubit Self-Powered Technology：Users do not need to plug any additional power cable in the motherboard(Only PCIe slot)and get each ports 2A(8A in total) max power supply for high power-consuming data device like Hard disc. Enjoy super easy installation with Plug & Play use. Compatible System：No need driver on Windows 8、8.1、10、Need to install driver on Windows Server、XP、7、Vista. Comply with PCI Express X1、X4、X8、X16 slot .Engineered Renesas(NEC) high performance chip-set. Power Module：4X added power module provide 4X2 ampere current ensure adequate power supply for USB device.4X electric circuit protector and voltage stable capacitance protect data safety than ever.